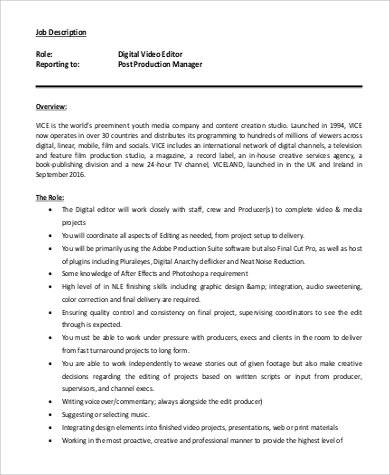 A digital editor is of great help to companies who use technology and other forms of media in presenting its products and services to its target clients. It is of much importance that a digital editor can do his or her functions so that a company or a business will be presented online the best way possible. 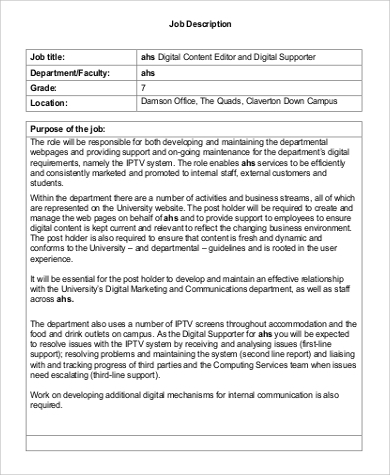 The digital editor specifically is tasked to be consistent in the application of his knowledge that can be of use to the work he is required to do. 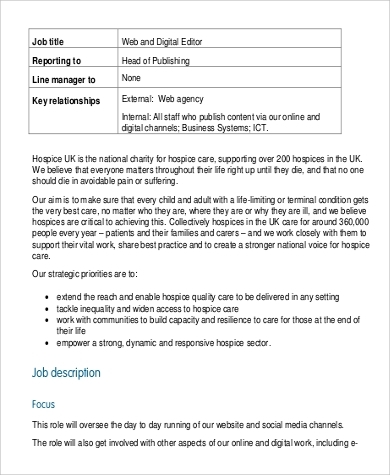 He or she maintains the quality of all online information within the website, pages, or social media accounts of a the company where he or she is working at. 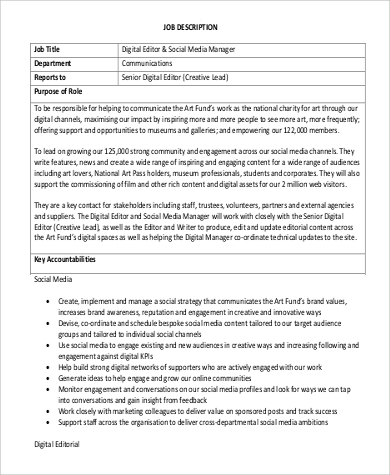 Aside from the job description of a digital editor, you may also view other Job Description Samples in the link provided. 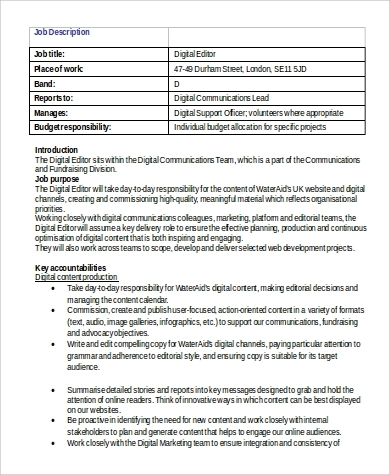 The digital editor has a very important role that is needed to be looked at every day. 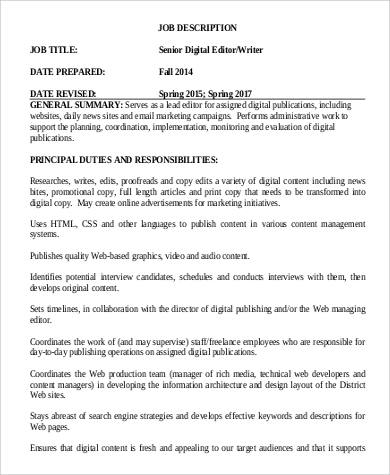 The company’s online reputation may depend on the digital editor and other various factors related to his or her work. The Web platforms used by companies are given special attention by a digital editor. 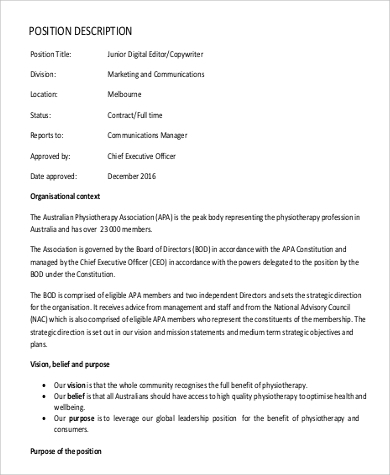 If the job functions of this editor is done properly, the result will fully benefit the company where he or she is working at in terms of brand visibility and growth in terms of online traffic. If you are to be a digital editor, your life will revolve around developing, creating, editing, and publishing different Web contents. It is great as a career path as it allows you to learn a lot of new things every day, and it gives you enough time to actually improve on what you are doing by studying different styles and processes that you may apply on your field. As a digital editor, you need to deal with deadlines especially on specific projects that are needed to be done immediately. 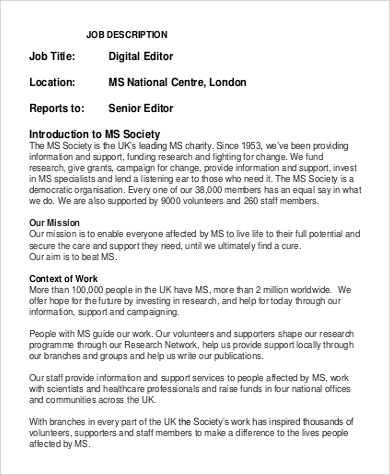 We also have an available magazine editor job description and editor job description should you also be interested to know more about their job functions. 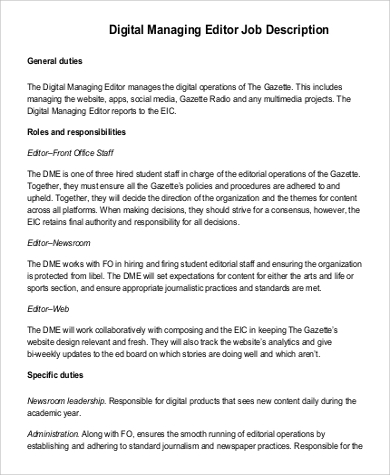 Since we have already given you an overview of what digital editors do, here are some of the precise tasks that digital editors deal with that you may want to know as well. Digital editors work with different teams and divisions of a company to assure that all media projects are done according to their timeline. They write commentaries, scripts, and even suggests music to be used in digital projects. Digital editors also need to practice and have knowledge on different tools needed for digital processes. They work on creating stories based on a footage and other recorded films. Being a digital editor may vary in terms of the nature of work depending on the company that hired you. Sometimes, they may give you the final decision on whether a content can be posted or not, and you may also be tasked to be present in all design and content processes. Those are only a few of what they do every day. If you think that you do the basics of their work, then try applying as one. Nonetheless, we also have Copy Editor Resumes to help you create your copy editor profile if you think that you can be better.